The last three years were more difficult for northwest Indiana than any period since 1993–96. Establishment employment peaked in November 2000 at about 277,000 jobs (it was, however, essentially stagnant between mid-1999 and mid-2001). Since then, it has declined by nearly 10 percent to about 250,000 jobs. That decline has occurred across the entire regional economy and has affected construction, manufacturing, and service jobs. The decline in the number of jobs available in northwest Indiana was relatively modest through most of 2001 and has been steepest during 2002.
around 275,000, a decline of only 5 percent). Furthermore, household employment bottomed out in March 2002 and has increased modestly since. The data (through August 2002) show limited signs of strength, with only business services and health services posting even modest employment gains over the past year. Construction employment also increased modestly beginning in June. This suggests that the coming year will continue to be a difficult one for businesses and residents of northwest Indiana. At best, employment may stabilize at around 250,000 jobs (and at a household employment level of around 275,000). More realistically, we may expect a continued, albeit slower, decline in employment, to around 245,000 jobs in northwest Indiana. It seems unlikely that the unemployment rate will fall below 6 percent, unless a growing number of northwest Indiana residents find jobs outside Lake and Porter counties. In this respect, the continued strength of the Chicago economy, and the apparent modest growth in the less urbanized counties of northern Indiana, is a hopeful sign. Figure 1 shows the path of total employment in northwest Indiana. This diagram shows a twelve-month moving average of total employment, which reduces the month-to-month swings in employment caused by seasonality and also allows us to see the trend in employment more clearly by smoothing the effects of one-time changes. (While the diagrams show twelve-month averages, the employment and unemployment data referred to in the text use the actual month-to-month data.) The local economy stagnated in the early 1990s with little change in establishment employment from 1991 through 1996. Beginning in 1996, however, total employment rose significantly for about five years, increasing by about 5.5 percent in four years (from about 254,000 to about 268,000). While employment growth in northwest Indiana was significantly slower than in the nation as a whole (nationally, employment rose from 119.6 million in 1996 to 132.2 million in 2001, an increase of 10.5 percent), it was nonetheless a good performance for the local economy. Employment fell modestly in the second half of 2001, but the decline accelerated in 2002. By August 2002, total employment had declined to a level last reached when the economy was expanding in 1995. Over the past few months, employment has been declining at an annual rate of about 5 percent. Such rates of decline are almost unheard of nationally and represent a serious state of decline for the local economy. 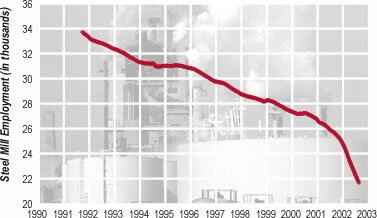 The decline affected all sectors of the local economy. Manufacturing employment declined (from August 2001 to August 2002) by 5,300 jobs, a loss of 12 percent. Steel employment fell by a rapid 18 percent, a decline most clearly attributable to the bankruptcy and sale of LTV Steel. The declines in sectors outside manufacturing were slower, but still relatively large. Construction employment fell by 3 percent (down from 16,800 to 16,300). Service sector employment declined by less than 1 percent overall, but retail trade declined by 3.5 percent and wholesale trade by 4.5 percent (a combined loss of 2,500 jobs). Given the strong performance of the service sector over the last decade (an 18 percent gain from October 1991 to October 2001 with almost no periods of decline), the recent weakness is noteworthy. It should be emphasized that much of the local decline in 2002 resulted from the closing of LTV and a continued weakness in the local economy. That is, little or none of the weakness of the local economy is a direct (or indirect) consequence of the terrorist attacks on September 11. All these changes compare unfavorably with the national economy. Employment also declined nationally, but at a much slower rate. Total national employment fell by less than 1 percent, construction by 1.9 percent, manufacturing by 4.8 percent, services by 0.1 percent (wholesale and retail trade both declined by slightly more than 1 percent). Furthermore, national employment hit its low in April and has begun to increase since. Locally, employment has continued to decline, with a loss of 3,200 jobs since April. The local household employment estimates are less reliable than the establishment employment estimates. An increasing number of northwest Indiana residents are finding jobs outside Lake and Porter Counties. Assuming the second of these is the correct explanation, the decline in local unemployment is more attributable to the strength of the surrounding region than to the strength of the economy in Lake and Porter counties. The local economy continues to be more concentrated in manufacturing (15 percent locally in August 2002 compared with 13 percent nationally), and specifically in steel (8 percent locally and 0.15 percent nationally). Thus, changes in manufacturing, and more specifically in steel, will have a greater effect locally than nationally. This suggests that 2003 will not be a strong year for the local economy. While motor vehicle sales have remained strong through 2002, the outlook for 2003 is for sales to remain essentially flat, thus failing to add to the demand for steel. Construction activity nationally also seems likely to recover only modestly, again not adding to the demand for steel. As a result, the demand for steel will grow slowly, if at all. It seems reasonable to expect, as a best-case scenario, a stabilization of the local economy with establishment employment hovering around 250,000. In this case, we might expect the unemployment rate also to stabilize between 6 percent and 6.5 percent. However, a sluggish national recovery (or a double-dip recession nationally) could drive local employment down by between 1 percent and 3 percent; this could lead the unemployment rate to increase to around 7 percent. In a continuation of a decade-long (or longer) trend, manufacturing employment in northwest Indiana fell by 5,300 between August 2001 and August 2002, a decline of 12 percent (see Figure 2). This represented an accelerated job loss from the 3,500 jobs lost between August 2000 and August 2001. As has been the case for some years, most of the decline occurred in steel (and directly related) industries; steel mill employment fell by 4,500 during the past year. Last year, a decline to about 41,000 manufacturing jobs by the end of 2002 seemed reasonable. Now it seems likely that by the end of 2002, the number of manufacturing jobs will fall to 38,000. By the end of 2003, manufacturing employment may fall as low as 36,000 (an additional 5 percent decline). But this is contingent on what happens in steel. Steel mill employment fell from 24,900 in August 2001 to 20,400 in August 2002 (see Figure 3). The (relatively) good news, however, is that almost the entire decline occurred with the closing of LTV in late December. 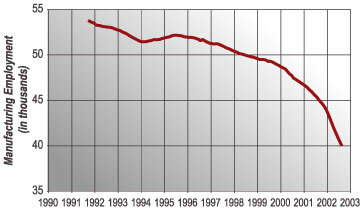 Steel mill employment has remained almost constant during 2002. The difficulties of the steel industry remain, however. Despite severe import restrictions imposed in early 2002, imports of steel fell only temporarily (from 3,356 tons in February to 1,896 tons in May, increasing again to 3,080 tons in July and 2,777 tons in August). The resilience of steel imports in the face of the tariffs imposed on them suggests that the domestic steel industry will continue to face strong competition from non–U.S. suppliers well into the future. In addition, the position of Bethlehem Steel remains clouded. And the industry as a whole still must address its cost structure, in particular the level of retiree costs borne by most of the integrated producers. It is also important to note that steel output in the Chicago region has recovered most of its lost ground. Weekly steel output in the Chicago region fell quite abruptly from 461 tons to 407 tons when LTV shut down its blast furnaces in late 2001. It continued to decline to 310 tons by the end of 2001. It has increased fairly steadily since and averaged about 460 tons per week in September. This 50 percent increase in weekly steel output during 2002 has occurred without any increase in steel mill employment. This suggests that the best that is likely to occur in steel in 2003 is stable employment. The new ownership of the former LTV is likely to find it easier to reduce employment during downturns, and the industry as a whole seems now better able to accommodate increased production without significant employment increases. Productivity will also continue to increase in the steel industry, so even if output holds steady, it seems that steel mill employment will decline, albeit modestly, to about 19,000 in 2003. Manufacturing's contribution to local income declined in 2002, despite increases in weekly real earnings. This resulted from increased weekly hours, because average hourly earnings remained unchanged. For manufacturing as a whole, weekly earnings rose about 3 percent (see Table 1). However, the 12 percent decline in the number of jobs, combined with a 3.2 percent increase in weekly hours, suggests that the total income generated in manufacturing declined by about 6.5 percent. Given manufacturing's 15 percent share of total employment, this suggests that the loss in manufacturing income by itself resulted in a reduction in total local income of about 1 percent. This is actually an improvement on the 11 percent decline in manufacturing income that occurred in 2001. The recovery in hours was something of a surprise, as was the increase in real weekly earnings. In fact, the average real straight-time hourly wage in manufacturing probably fell (as a result of declining employment in the highest-paid industries) but was offset by some additional overtime. It is reasonable to expect total manufacturing income to decline in 2003 as well, although perhaps at a slower rate. After a decade of rapid growth (as these things go in northwest Indiana), service sector employment stumbled in the past year. Employment fell by 1,600 jobs (less than 1 percent) and is down from a peak of 206,600 jobs near the end of 2001 to 195,200 jobs in August 2002 (slightly more than 5 percent). This is wholly accounted for by weakness in wholesale and retail trade (where employment fell by 2,500 jobs), which was not offset by continued growth of business services (up about 2.5 percent, only 300 jobs) and health services (up 2.8 percent, or 700 jobs). Local government employment also increased (about 1.8 percent, or 500 jobs). State employment fell by 100 and federal government employment did not change. The seasonal decline in retail employment was even more pronounced in 2002 than usual (and it was unusually pronounced in 2001 as well), but the usual strength of retail in the spring did not show up. The mid-year decline did appear, however, just as in past years. While we can expect the usual end-of-the-year increase in retail employment in 2002, we cannot expect any early impetus from retail activity in early 2003. In fact, the last two years argue for a larger-than-usual decline in January and February. It is clear that the state government faces a serious budget situation over the next two years. State government employment, as a consequence, is unlikely to rise and may well fall. In addition, there will be downward pressure on compensation of state government employees, so even stable employment is unlikely to generate increasing incomes. These pressures may well affect local governments because they derive significant revenues from the state (such as in education). Growth in the government sector, then, seems unlikely to provide a stimulus to local economic activity. Overall, we cannot count on the service sector to generate significant employment (or income) increases during 2003. A gain of between 1,000 and 2,000 (0.5 percent to 1 percent), probably concentrated in business and health care services, seems the most probable outcome. The local economy has not shared to any noticeable extent in the tentative national recovery. There is no particular reason to expect a strong, or even a weak, recovery in 2003. Continued weakness in manufacturing and stagnation in the service sector will likely combine to drag local employment down modestly (a 1 percent to 2 percent decline) in 2003. Local unemployment rates will probably rise slightly in response. In the longer term, the ability of the steel industry to cope adequately with a non-competitive cost structure and aggressive foreign competition will have a larger influence locally than nationally. The restructuring that is likely to occur in steel will almost certainly have consequences for employment practices and may well have consequences for compensation. In addition, the ability of northwest Indiana to prove a hospitable location for new or relocating firms, and the ability of the region to generate new locally-owned and controlled firms, will be crucial to sustaining a strong local economy. While undiscussed here, population and demographic issues—especially the age structure of the local population and the education of the local labor force—will affect local economic development. While the immediate future does not look terribly bright, the longer-term future can be what we decide to make of it.